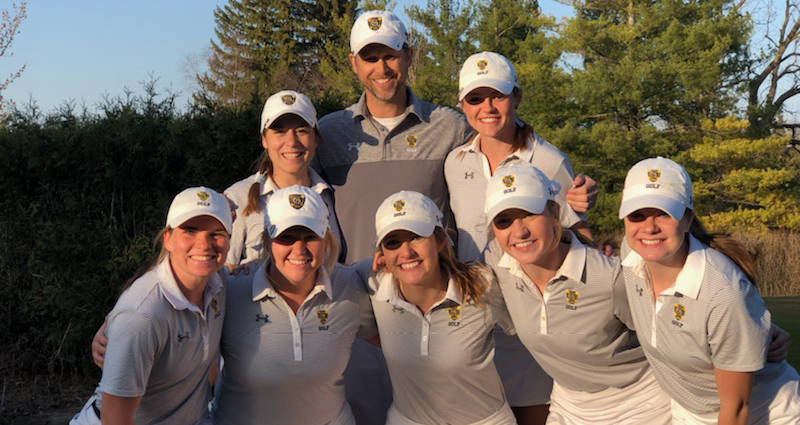 NORTHFIELD, Minn. – The Gustavus women’s golf team wrapped up its season Sunday with a fourth place finish at the Carleton Invitational, played at the Northfield Golf Club. The Gusties shot a two-round total of 335-328-663. Host Carleton won the event with a score of 615. McKenzie Swenson (Sr., Buffalo, Minn.) and Jessica Nelson (Sr., Plymouth, Minn.) ended their collegiate careers today. Swenson tallied an 82-74-156 to finish in a tie for fifth place, while Nelson posted an 82-85-167 to tie for 21st. Kristen Cash (So., Roseville, Minn.) tied for 17th with a score of 82-84-166, while Ellie Brandt (Jr., Wayzata, Minn.) took 31st at 89-85-174 and Morgan Bleyhl (So., Elk River, Minn.) placed 39th at 91-89-180. Way to go Mac!! Best wishes to you and Jessica! See everyone in the fall! !